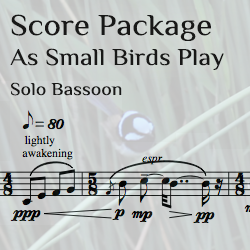 This download package includes the score for solo Bassoon and recorded birdcall sound track for live performance (options include single continuous track or use of two sound cues as per score). Birdcalls recorded in Capertee Valley NSW by Corrina Bonshek. Mixed and mastered for live performance by Benedict Carey. The recorded birdcalls will be made available via dropbox link due to file size. Please allow up to 24 hours to receive an email with that link.